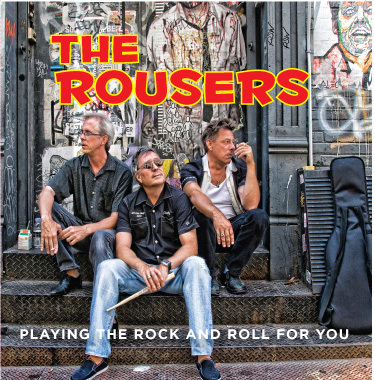 Song of the day: The Rousers – "Here She Comes"
An American band called The Rousers asked me to talk about their album, Playing The Rock And Roll For You. I was all set to do that, but I was waylaid by two things – the band name, and one of their songs – that distracted me from my mission (of listening to their album). When I searched for “The Rousers” for links to appear at the end of this post (I like to provide as many links to bands as I can), the search engine I used asked if I meant “trousers” instead. Unfortunately, I now want to call the band “The Trousers”. I must admit that I didn’t get past the first song, “Here She Comes”. It’s not because that first song is awful and I didn’t want to hear any more. I thought it was fine. And I have no idea if the other songs are horrible. Anyway, I’ll present you with “Here She Comes” and its coincidences, and point you in the direction of the album so you can listen to it at your leisure. You won’t believe this coincidence (I’m having trouble believing it myself), but I was actually reading about The Jags just before playing this song. Earlier in the morning I had responded on the blog to commenter Jon about his love for the All Music Guide, and mentioned that I thought it was great, too, but hadn’t pestered it recently. This prompted me to pay it another visit, and while I was there I spotted AMG’s section on Power Pop. I duly clicked on the link, started reading the article, skipped to the end (there was a lot to read, and I wanted to get to the more recent stuff) where it talked about the newer generation of power pop bands. One of the bands mentioned was The Jags. I’d never heard of them before, so I clicked on their AMG profile, read about their debut album, Evening Standards (1980), and clicked on the review to read more. “Hmm, that sounds interesting,” I thought to myself. “I think I’ll have a listen.” I found the album, and while it was hurtling its way down the wires I decided to read your email and start listening to your suggestions. I saved them to the hard drive, listened to The Five Americans track first, then saw the next track, “Back Of My Hand”. It was by The Jags. I played the rest of it, and was relieved that the whole thing didn’t sound like “Friday On My Mind”. But I did discover why the AMG reviewer mentioned how The Jags were dismissed at the time for sounding like Elvis Costello: the singer sounds like he’s impersonating Elvis Costello. If I remove thoughts of Elvis Costello, then what I hear is a competent three-chord skinny-tie song – just like piles of other skinny-tie songs. To me, this was one big musical coincidence involving two other songs. The verses in “My Pledge Of Love” (e.g., 0:16-0:38) remind me a lot of the verse in The Platters‘ “Twilight Time“, and the middle eight reminds me of the Four Tops‘ “Baby I Need Your Loving” – especially when the Joe Jeffrey Group’s singer is singing “Baby I need your loving / Got to have all of your loving…” (from 1:36 to 1:41). It’s all a bit too much of a remind-y song for me. The singing’s OK, the playing’s OK, but it doesn’t leap out at me and make me want to shout “Soul! Yeah!”. This, to me, is the sound of Bob Mould chasing commercial success. That’s entirely reasonable, considering his previous band’s lack of monetary gain and fame*, but it tends to dilute the music and lends it a certain anonymity. Is the word “generic” too strong here? The song was listenable while it was playing, but at soon as it finished I’d forgotten how it went. Keep those songs a-comin’, Frank. You are currently browsing the archives for the Jags category.